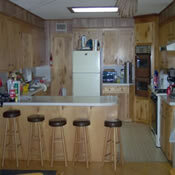 The lodge offers a large living area, dining area, and restrooms. There are 14 tables with 4 chairs at each table in the dining area for your dining pleasure. 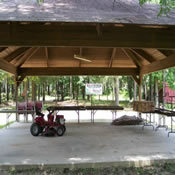 Our Pavilion facilites are great for outdoor gatherings. 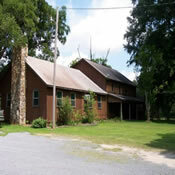 The pavilion offers approximately a 24’ X 24’ covered area. Tables and chairs can be set up for eating or the area can be used for weddings, meetings, etc. There are six eight foot tables and approximately 50 chairs available for your use. The kitchen offers a full-size refrigerator with freezer, microwave oven, 4 burner stove with oven, food processor/blender, mixer, and community coffee machine. There is a big screen television in the dining area. The living area has two couches, 5 chairs, a 25” television, and a pool table. There are 3 bedrooms downstairs. 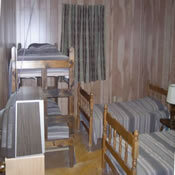 Each room comes equipped with two single beds and 1 set of bunk beds. Bed linens are furnished for your use. They consist of sheets, bedspread, and pillow. There are blankets in each room for your use if you choose. The door to each room can be locked with a key supplied to you for your use while there. The upstairs area is equipped with four sets of bunk beds and a couch that folds out to a queen size bed. There are also two tables with chairs and one recliner. There are two bathrooms downstairs. 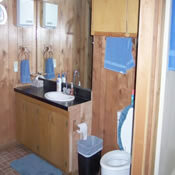 One has a walk-in shower with a bench seat to sit down if needed. The other has a tub/shower. Towels and wash cloths are provided for your use. There is a hair dryer in each bathroom and soap and shampoo are also provided. The bathrooms are accessible from the porch on the back side of the lodge or by walking through the living room area inside the lodge. The upstairs bathroom has a commode and sink only.